Cee: Is this thing on? Cee: A-ha. I guess we’re back? Ess: If you can hear us, do nothing whatsoever. We’ll notice. Cee: So, how do we justify this absence, Ess? Ess: Getting tagged? Greater badger invasion? Overloaded brain cage? Ess: …Hello and welcome to the very sixth issue of Running on Italics, in which we tackle the corp side of Chrome City! We do apologise, folks, for the ridiculously long delay; as it turns out, both of us were moving over the last couple of months. Ess: I categorically deny saying any such thing about people who are capable of killing me. But Manchester does seem to have a fun meta so far! Cee: In any case, we’ll try to catch up to The Underway and Old Hollywood as quickly as we can. So, in that spirit, let’s get to the cards! Ess: Christ, that art. So very grittily industrial, with searchlights and patrols and a giant fuckoff metal fence. Cee: They embossed their logo on the gate. They want everyone, especially you, to know that they own this. Go. Away. Ess: They so clearly want nothing to do with the outside world. So this is the factory complex built at the heart of Oaktown, right? In the same way Jinteki Biotech owns the Valley? Cee: No, I don’t think so, actually. It’s the Weyland card later in this pack that’s Corporate Town, and even then that doesn’t seem to be anywhere near the entirety of the town. Oaktown just seems to be a giant industrial complex inside Sansan, that both Haas and Weyland have just set up shop in. Ess: Ah, of course! That also explains why they might be worried about industrial espionage, or at least find it useful to present themselves as worried about industrial espionage. Cee: What about the ability, though? A smaller deck size means, what, company focus? Ess: We’re gonna make the best damn cybernetics you’ve ever seen. And nothing else. Cee: —is not what I was going to say but sure, okay, that. Ess: I dunno, it’s not like a division-wide mandate of “so yeah let’s build a divinity woo” translates into specific focused tasks for each individual employee. Whereas Cybernetics Division is highly specific, highly tangible work. Ess: That’s the entirety of NBN being led under that singular, acknowledged mandate to take over the world. How quickly do you think Google could take control of our culture and politics if Larry Page and Sergey Brin wanted to? Ess: What I want to know is what the corp half of the ability is supposed to represent, here. The runner half tracks; presumably they’ve got some backdoor into the basic cybernetics runners have. Cee: What is corp hand size, anyway? Ess: We’ve seen only four other cards that interact with it; TWIY, Research Station, Itinerant Protesters, and … Cerebral Imaging. Let’s not talk about Cerebral Imaging. Cee: So mechanically, corp hand size is how many options you have at any one time, right? It’s the ability to divert your company’s or division’s assets towards these projects, of how many people you can keep on standby to be ready to get these done. Ess: Are we talking about liquidity? Cee: Some measure of the liquidity of all their resources, human capital and project assignments as well as actual monetary liquidity, I suppose. So Cybernetics Division, I guess because of their strict mandate, are less flexible on this count; they’ll always have a lot of folk assigned to making the chips go out the door. Ess: Mmm. So I guess that’s Cybernetics Division, then: paranoid, focused, and vengeful. I have to give this card an A; it so cleanly captures both Oaktown and the state of Haas Bioroid in it. Cee: Yeah, totally agreed. A.
Ess: So this is pretty easy, right? It affects the runner’s hand size! Cee: …I am going to pretend you didn’t just say that. But, yes, whatever backdoor the Division has into the general runner cybernetics tech, this is just the agenda version of that. Just like GRNDL starts effectively with a Hostile Takeover scored. Ess: …seven credits, two to advance… the math checks out. Huh. Cee: Though, I mean… so you blew up their arm, but then don’t they just go get another one? Why is it a permanent hand size reduction? Ess: If you score two of the agenda, you can blow up their legs as well! Ess: This is the true power of monopolies. Kids, support anti-monopolistic legislation, or else corps will blow up your arms. Cee: This card is so dumb. Ess: But, yeah, the flavour text is just a bit cute. They’re dangerous in the runner’s hands! Physically in! This card is pretty much made of puns. Cee: Bad puns. I’m going to dock it points for overuse, regardless of how flavourful it may be. C+, and it coulda been a B.
Ess: Aw, I don’t think it’s that bad. Lookit how hard it’s trying. I’m giving it a B-. Cee: See, this could have been a good pun. Why isn’t it a Labrador? Ess: I’m not sure Labs are capable of looking angry, though. This render is explicitly pissed. Cee: It’s just a missed opportunity, given the name… actually. Why is it named Lab Dog? What’s a lab dog? Are we talking about dogs being experimented upon? Ess: I thought it was just a dog guarding the lab? Cee: Then why isn’t it called Guard Dog? What’s the go with this dog, Ess? Cee: FCC regulations being “before your time”, hmm. It’s suggesting, what, that the FCC and similar governmental bodies have lost their regulatory power? Ess: Or even that the FCC’s dissolved completely, because cyberpunk! If we assume Heinrich here is around sixty, that suggests that whatever it is happened sometime in the past forty years. Cee: So you’re suggesting the “harmful interference” is some sort of byproduct of whatever they’re working on in the Lab? Ess: It makes some sense, right, for a Trap? The Dog was never designed as ice; it was just a destructive side effect that quickly ended up being considered useful and repurposed. Cee: Okay, but now I’m wondering what that effect is. We’ve seen ways to trash hardware before, even ice – Taurus and Flare, but Power Grid Overload, Power Shutdown, and Shattered Remains all hit runner hardware. But I feel they’re all a bit, uh, weird. Cee: Lab Dog can trash your gun. Ess: Lab Dog can trash your bike. Yeah, this is weird. Cee: Yeah, I’m not happy with the state of hardware trashing in the game at the moment. Cee: The corp can impound your bike if they have a tag on you? Yeah, that does seem to make sense. Ess: I’m happy to give Lab Dog a C here, nevertheless. Cee: This is such a clean card. Great art, great effect, great flavour text. Ess: This is the card that tells us what Oaktown is. Sure, there’s stuff to talk about in the Corporate Town and Renovation and Division, but if you just want one picture of the Chrome City, you come here. Cee: They built this place to last. Crates and cranes and cybernetics. Ess: There’s almost a fetishisation of metal, actually. I wasn’t sure at first why the Grid was a Haas card—like we said earlier, they don’t seem to own the city in the same way Jinteki owns the Valley. But even just looking at the card frame makes that clear: Haas is most aligned with the values of Oaktown. Cee: Steel and rivets and the giant, imposing logo embossed on your gate. Cee: Actually, that’s an interesting point. Haas works in software and cybernetics, which are not classically associated with the industrial age connotations of strength and stability. They build their bioroids, sure, but even then they design them to look unimposingly human. Ess: Oh, huh! You’re asking whether Haas is trying to get some … splashback street cred by tying themselves this closely to Oaktown? Cee: Not specifically; there’s definitely a lot of their aesthetic that still evokes heavy duty engineering. I’m more asking whether they see their bioroids as part of a new industrial age. Ess: Oh, huh. That… makes their conflict with Jinteki ideological. Haas believes that they’re working towards human eudaimonia, developing machines that can better and better save us labour and strife, and this explicit moral distinction between humans and the machines that serve us is entirely the point. Of course they would have problems with how the big J treats the humans it creates! Cee: Well. I don’t think they’re too happy about the competition, either; let’s not forget the profit motive is always going to be the most effective driver. But… yeah. I’m now pretty disappointed that Creation and Control chose to focus its flavour insert on Tommy, and not Director Haas. Ess: “Whatever I bloody want it to do.” She’s certainly a fascinating and underexplored figure. Cee: Right! So, Oaktown Grid. A+? Ess: Yeah. There’s no way this wasn’t getting an A+. Ess: I see your what and I raise you a wat. Cee: I guess he has a pet Zed? That he’s tossing at the runner? Ess: What are you even doing, Mister Knight. Okay, if we have to make sense of it—you can only use it if the runner has no clicks left, because otherwise the runner would just click through it? Cee: But that isn’t the same thing at all. You should then be able to use him when the runner has clicks left, but doesn’t want to. Like, they want to save a click to clear a tag and they know you have double Scorch in hand. Cee: Also, what is going on with his flavour text. Ess: Uh. Are… bioroids… p-zombies? But no, that doesn’t track; p-zombies don’t have any awareness that they’re not conscious. Cee: Gruh. Ryon Knight, we don’t understand you. Ess: We’re terrified of you, but we don’t understand you. Cee: Keep… doing what you’re doing, I guess. Cee: So the first comparison is to Matrix Analyser. That’s still the only other ice that can advance an agenda, right? Ess: Builder can place advancement tokens on ice only, so yes. So the Monitor and the Analyzer could be using the same mechanism to advance things… but, hang on, wait, how does Analyzer work? What is that mechanism? Cee: “Analyzing was great. Delegating commands turned out to be even better.” We can assume “analyzing” refers to its trace and “delegating commands” to the advancement token, so maybe this piece of artificial intelligence is convincingly acting like upper management to the team working on the agenda? Ess: Hence why you still need to pay them for overtime, but don’t need to spend a click? Cee: And Jinteki saw that hey, that’s actually the more useful part of the ice, so they built their own little AI that looks into the future to manage a team? When it can predict the runner, it can extract money from them, somehow? Ess: I gueeeessss? I mean, there’s nothing seriously wrong with this interpretation, but for some reason it still feels like a stretch. Cee: That’s because it is. The art is pretty neat, with the glowing camera that can see into you but you can’t see into it… but what are the little waldos around it? Is something in its eye? Ess: Little mobile psychic spotlights or something? Cee: Eh. Whatever. I’m giving this card a C.
Ess: Yeah, I’m with you there. Cee: The runner has a lot of ways to draw cards. Ess: Chugging a can of Diesel. Spending Quality Time with your bae. Going to a Game Day. Schmoozing with your Professional Contacts. Cee: And somehow this ice locks them all down? Ess: So surely whatever it’s doing isn’t purely disrupting communications, because why would that stop you from grabbing an energy drink out of your fridge, right. Cee: Is it psychological? Some form of temporary induced paranoia, closing the runner off to new ideas, making them distrust everyone and everything they can think of. Ess: At least until they get a good night’s sleep! Ess: It’s interesting that you’d come to that interpretation, actually. I’ve heard people playing Lockdown report that it has a legitimate psychological effect on the real life player. Cee: They start seeing Lockdowns everywhere? Ess: Being denied the ability to “heal up” seems to matter, yeah. Apparently they tend to start assuming every two unrezzed ice are Komainu into Lockdown. Cee: That’s a fairly deep flavour to mechanics correspondence, then. Nifty! Cee: I’m not convinced by the art, though. It’s clearly meant to be impressionistic, but that targeting reticle is definitely sending a message. You are the weakest link. Ess: Goodbye! So you think the art is before the lockdown, not the attack mentioned in the flavour text? Cee: I think so, yeah. What’s up with the flavour text, anyway? It’s reads like it’s from Sun Tzu’s Art of War. Ess: Cute. The Hacker’s Playbook perhaps. Who’s the author? g00ru? Cee: Iain probably wrote a Playbook, after he retired. He called it “On Secrets.”, because of course he did. Ess: So Lockdown ends up being clean and elegant, and even has a strong flavour to mechanics correspondence to boot. Does an A sound about right to you? Cee: Call it A-, but yeah, sure. Cee: Kate’s little quote here is on the money. This ice was birthed from many a sleepless night worrying about performance indicators and deadlines. Ess: The mechanics, of course, parallel that story so adorably. Do the hard work, get rewarded! Cee: There’s not terribly much to say on the art besides Achievement Unlocked: Terrifying. Imagine being chased by that everytime you shut your eyes. Ess: Lots of psychology in this pack. What is Chrome City doing to people? Cee: That … is an interesting question. So Chrome City is, we’ve established, a dockland city. It’s grim and gritty and full of people who will willingly gouge out their own eyes to see better. Ess: The direct contrast is to The Valley, and it continues to be so incredibly appropriate oh gosh that the corporations that are the faces of these two opposing cities are the lifelong rivals, Haas and Jinteki. Cee: Yeah. Where the Valley is at least shiny on the surface—”Turns a night owl into an early bird!”—Oaktown makes no pretensions about itself. If you live here, it seems, you are well acquainted with how life hurts. Ess: So if Ryon Knight is the darkness of the Chrome City, the very darkness of the human condition, given agency, Little Engine is that darkness screaming, in fear and in pain, screaming to anyone who will hear. Even Runners. Cee: And, as a corporation, that primal fear is useful. Look, it makes for such an efficient piece of ice! Ess: A+. I can’t not give it an A+. Ess: Gosh, this is just so Weyland. Cee: We don’t care that you know we’re renovating Oaktown. Our names are stamped on the crates. It makes us money and it advances our corporate goals, and that’s all that matters. Ess: And hey, we’re renovating Oaktown. Who could be upset about that? Ess: …actually, now that you mention it, why aren’t cards like Clone Retirement public agendas as well? Cee: Or the upcoming Global Food Initiative? Ess: Okay, so go with me on this journey. Ess: The reason agendas are generally secret isn’t to protect them from the runner, it’s to keep secret from their competitors what the corp’s gameplan is. As big as Haas is, they have competitors, and those competitors could use the knowledge that Haas is spending their time on Project Vitruvius to pivot and outcompete them somewhere else. Cee: That assumes a very fast turnaround time, at least if we’re sticking with the idea that turns are roughly days. Ess: Yesyesyes, but go with me here okay. It’s interesting to note that the mechanical distinction of agendas isn’t that they’re worth points to the Runner (as there are assets worth points and agendas worth no points), but that other corporations can’t have them. They’re projects whose internal details you keep as the utmost secret, because of how critical they are to your twenty year plan. Cee: Yes, fine, Domestic Sleepers is a 2/0 you are technically correct. Ess: The best kind of correct! So when the runner steals an agenda, not only does the corporation not get the agenda, but they’ve hurt the corp, as well. By revealing not only the agenda’s existence, but its internal workings, the Runner’s helping those leaner, scrappier competitors fight over the project’s corpse. Shipping manifests. Source code. Production lines and designs. Ess: Oaktown Renovation, then, isn’t a dare from Weyland to the Runner, though as Chief Security Officer you can use it in that role. It’s a dare from Weyland to any local competitors who might be thinking of muscling in. Cee: Yeah, okay. I’m not totally convinced that this narrative is the correct one, but I can see some merit in this read. Cee: No. Anyway, I’m happy to give the card a B+. Ess: I’ll give it an A, as befits my aching legs. Cee: This is going to be another one of your cynicism moments, isn’t it? Ess: Oh hellls yes. What were we saying about the dark heart of Chrome City, of humanity, before? Well, if you’re a Weyland employee, you don’t have to worry! Everything’s all sunshine and manicured lawns and good old fashioned corporate values. Cee: They don’t even care that the illusion is partially broken. The skyscape is explicitly manufactured, and Chrome City lurks just beyond, very visibly, a reminder in the shadows. We are protecting you. Ess: If you make them participate in their own deception, they have more incentive to not break out. Pretty sure that’s in Sun Tzu somewhere. Cee: And we’re all apparently from the 60’s. Just like the Genetics advertisements, though this seems less the “technopositivism” you were going on about then and more just part of the wilful deception necessary to live in such a place. Ess: Yeah, I don’t know whose idea it was to structure the Corporate Town with that aesthetic, but give that spawn of satan a raise. The art—the perfectly astroturfed lawns, the happy mother with her baby, the simple little company car—could not be more on point. Cee: Corporate Town seems to be entirely about making that aesthetic work, actually. It’s commentary on how our darker sides scare us so much that we’re willing to blind ourselves to them. Ess: And that ties into a discussion on that particular flavour of free market capitalism, or even some strains of democracy, which find it very easy to give the populace what it wants to further their own goals. Cee: Yeah, Weyland being the city council in this new town creates an explicit analogy between the capitalist project for keeping their workers happy, and the direct governance tasked with keeping their population happy. Ess: That analogy could not be more apt, could it? Corporate Town is what the world looks like after Weyland’s Government Takeover, and we, as participants in the free market, are complicit in helping them get there. Cee: This card doesn’t deserve any less than an A.
Ess: Again, I can’t not give it an A+. Cee: Does what it says on the box, it seems. Ess: Well I mean kinda. That’s not really how it plays out in the game; they run it once and then don’t run it again until they have a tool to deal with it—and most runners do have a tool to deal with it. Cee: You could read the name as aspirational, then. The programmer of this ice wanted it to behave like quicksand, but didn’t count on the number of ways runners have of breaking that behaviour. Ess: Aw, I feel bad for the ice now. Its programmer had such dreams for it—! Laid low by those pesky runners. Cee: It’s not even like Quandary where you can fulfil its dreams. Poor Quicksand. Cee: Couldn’t ask anymore from the art though. Clean, simple, and evocative. Ess: B+ seems fair to me, here. Cee: B+ feels right, yep. Cee: Some really fantastic cards in Chrome City. This half really solidified the theme for me, which was lacking on the Runner side. The overwhelming darkness and grunge of the city is just so evident. Ess: And our average mark for the Corp half is probably our highest ever, too. Cee: And the art was just as solid as the Runner side, only being let down by some weird mechanics integration. Almost a home run here! Ess: So, yeah, I think we managed to get back into the Italics game on a strong pack, and christ am I excited to tackle The Underway. Cee: And Old Hollywood, and The Universe of Tomorrow… and all of Data and Destiny, really. And then the Mumbad Cycle! 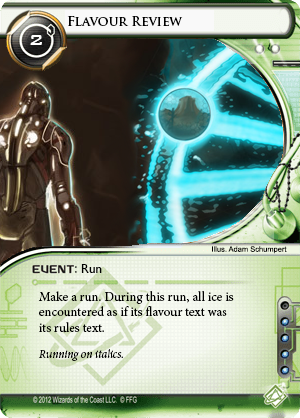 These are exciting times for Netrunner, apparently. Ess: We hope you’ll join us in our excitement then! This is Ess and Cee, signing off.